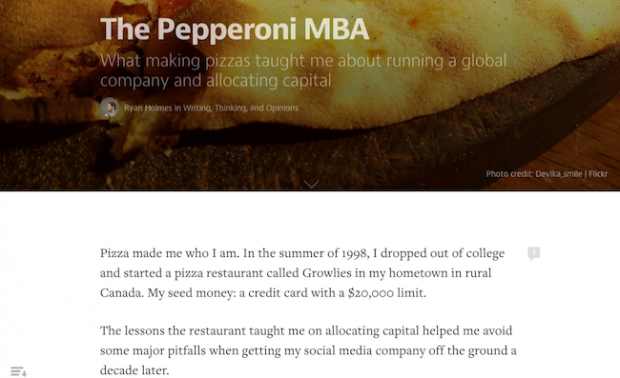 The ever-changing home page header of blogging platform Medium. Did you know that 76 per cent of B2B companies use blogging as a part of their marketing efforts? If that number seems very high, it may be because most of these businesses are likely referring to product-focused company blogs that are rarely updated, don’t generate much traffic or help them reach broader audiences. For blogging to be an influential part of a business’ content marketing strategy, employees need to be empowered to blog on behalf of the company, and they need to be doing it on a growing number of popular blogging platforms. Which is perfect for business professionals looking to attract a new audience. Medium pushes you to focus on the content, not the call to action or the buttons or the video player. While your own blog should be analyzed, optimized and tied back to revenue, on Medium you have the freedom to write something for the purpose of sharing ideas that might appeal to a broad audience. You can experiment with new subjects and themes not directly focused on your product or service. The beginning of a post by HootSuite CEO Ryan Holmes on Medium. That’s not to say your posts can’t have a business element to them. Medium is full of founders and CEO’s talking about their company and what it has taught them. It’s full of authors sharing book excerpts and artists discussing their work. But — in the case of successful posts — it’s done tastefully, and in a way that adds value for their readers. Content is also divided into collections, categories like “On Startups,” “Tech Talk,” and “Cyber Security” that help people find the stories they are interested in. These readers can also offer feedback in comments that appear along the right side of the post, making the content itself a forum for engagement. Join Medium if you want to participate in a conversation that may teach you something, or allow you to teach others. In the fall of 2012, LinkedIn created an influencer program, inviting the likes of Richard Branson, Bill Gates and HootSuite CEO Ryan Holmes to share industry insight with LinkedIn users. The opportunity provided these thought leaders with a massive new audience, often of hundreds of thousands of professionals, and turned LinkedIn into a source of valued business content. Now, that publishing platform is yours to take advantage of. Linked recently announced that they were opening up their publishing platform to all users over the next few months. You will now be able to follow users outside of your network, and gain followers of your own. Look at the LinkedIn publisher as a way to share your expertise. Where as Medium is an interesting place to experiment with new themes and connect with a broad audience, LinkedIn should be used to highlight your niche. Give professionals in your industry a concrete reason to follow you — be it unique insight into your job, tips for them to utilize, a fresh perspective on the future of your industry, or anything else they could confidently share with their boss and coworkers. A screenshot of the Exposure home page. Many companies utilize YouTube, Instagram, Pinterest and other networks to showcase their brand story using beautiful imagery. 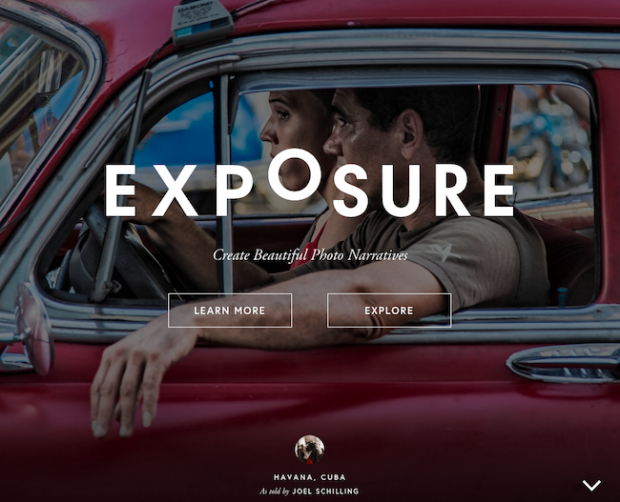 With Exposure, the idea is to actually tell that story in narrative format. The platform encourages the use of large photos interspersed with text to help you explain and link the visuals. People love visual media, and being able to tell your professional story using this type of format has the potential to be very powerful. If you are a photographer or incorporate photography into what you do, this platform was created to be simple for you to use. A relatively new tool, Exposure also doesn’t have many brands on it yet, which means you can get in close to the ground floor and become a leader on this new platform. Are there any other new blogging platforms we should be talking about? Let us know in the comments.